22-year-old Deandra Wheatley started at a carpentry school in St. Thomas. After a field trip with My Brothers Workshop, a non profit on Island, she learned to use her skills to give back. “Building bridge, stairs, tables,” Wheatley added. Now she is helping with their next project rebuilding Little Blossom Daycare in Smith Bay. Jenny Hawkes, Executive Director of My Brothers Workshop, said they’re choosing places that can make the biggest difference down the road. “The daycare center has about 25-35 students who come everyday and then during the school year they’ll be coming after school for the after school programs. This area is an area that services low, socio economic families, so when these two were shut down it was very difficult for people to go back to work,” Hawkes added. This is the next project for workers and thanks to a very generous donation, they’ll be able to complete it by the new school year. 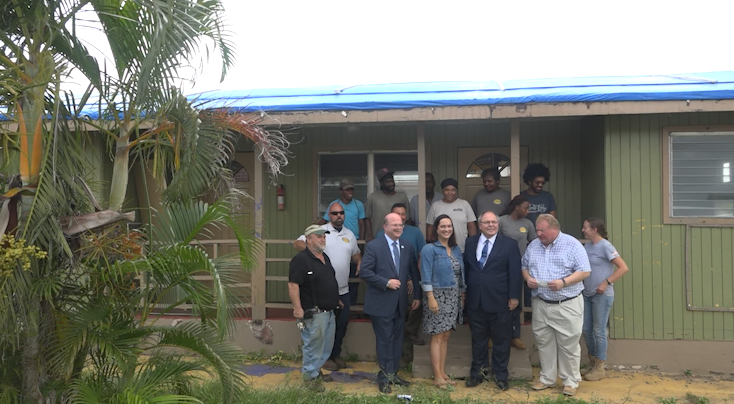 On his first trip and first official visit of an Israeli Representative to the Virgin Islands, Ambassador Dani Dayan from the Israeli Consulate in New York, wanted to do something to give back to the community. “These children, they’re in need of a full fledged operating facility, we want to contribute to that here and now,” Ambassador Dayan said. Ambassador Dayan said he plans to keep communication open with the Island even after he returns to New York. That includes a partnership with The Jewish Federations of North America and the local synagogue’s on Island. “Bring their story to outside the Virgin Islands because their recovery is as important as anyone elses’ recovery,” Edward Finkel, Regional Director at the Jewish Federations of North America said. “Joint effort lifts all boats and that’s the goal,” Rabbi Michael Feshbach, Hebrew Congregation of St. Thomas added. Just like the workers at My Brothers Workshop, everyone in this room- wants to come together, to help the future generations to continue on. “Feels good, it feels really good. I feel happy seeing the joy on their faces and people and then they come to me and thank me for what a good job I’d be doing. So it really touched my heart,” Wheatley added.